Puerto Escondido, Mexico – Vivo Resorts in Puerto Escondido, Mexico, started welcoming owners of its newest residence, Laguna, in March – part of a larger trend that’s seeing more and more Canadians escaping winter’s chill each year by heading south to the warmer climates of Mexico, often purchasing property and staying for extended periods of time. “Not only is our ownership group proudly Canadian, but many of our property owners are too,” said Cary Mullen, former Canadian Olympic skier and developer of Vivo Resorts. New owners started taking possession in the Laguna building throughout March, and construction of the next condominium residence, Marino, is well under way. In addition, steady sales of Marino’s sister building, Nautico, have Vivo Resorts targeting mid-May to commence construction on this building. Photo Caption: Aerial view of Vivo Resorts and its pristine beach with Laugna residence pictured at top of photo. People come for the sunshine – the average daily high, year-round, is 30 Celsius – but there are many other reasons too, such as the vibrant local culture and rich history; the friendly people and their relaxed lifestyle; the ocean: the delicious food and drink and, of course, affordability aided and abetted by a favourable exchange rate of $1 Cdn to $14.41 Mexican pesos (at press time). Canadians can stay in Mexico for up to 180 days per year, or, retirees can choose to apply for a temporary resident visa which lasts for up to four years. Non-residents can qualify by owning a property in Mexico with a value of around $207,000 (USD) or more. The resort property is a gated community of private villas and luxury condos just 9 miles from downtown. At build-out, it will feature 114 private dwellings and over 400 condominiums, as well as a shopping area. In addition to 800 yards of pristine beach frontage, the resort’s social hub is a $7 million, 53,000-square-foot, clubhouse featuring amenities including a spa, ocean-view fitness facility, upscale restaurant, sports bar, tennis courts and large event space. Also on the property are a general store and two infinity edge swimming pools with swim-up bars and a family pool. A convenient private shuttle service offers easy transport to/from Puerto Escondido, while the Vivo Rental Program offers a hassle-free vacation rental option for condo owners. Residences in Vivo Resorts offer multiple floor plans, sizes and prices to suit a variety of buyers. For those who want a waterfront experience, every suite in the Marino and Nautico buildings have panoramic, unobstructed, ocean views. Both buildings offer one, two and three-bedroom plans ranging from $339,000 to $624,900 USD. For those who prefer to lounge by the pool or enjoy lush gardens, Botanica residences offer one and two bedroom homes ranging from $244,900 to $314,900 USD. Buyers seeking a more posh experience can choose from a number of different pre-designed private villa layouts or build a custom villa starting at $200 USD per square-foot. Pre-designed options range from $344,900 USD for a 1,550-square-foot, two-bedroom, two-bath home to a 2,988-square-foot, three-bed, three-bath home for $584,500 USD plus the cost of home site. 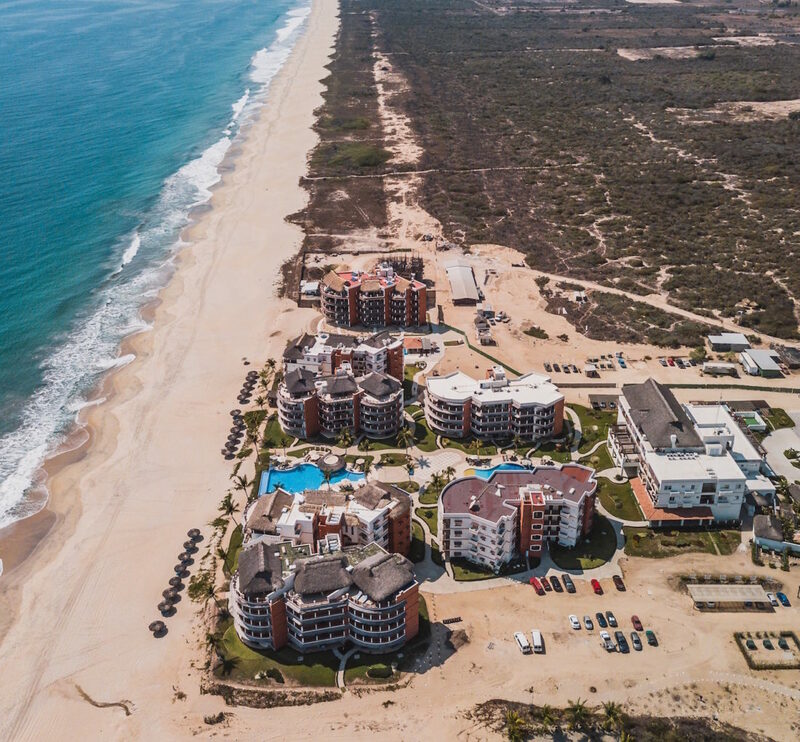 Vivo Resorts is a US$ 200 million gated community of luxury condominiums and private homes located 10 minutes from downtown Puerto Escondido, Mexico. Founded by two-time Olympian, World Cup champion downhill skier and visionary developer, Cary Mullen, Puerto Escondido was chosen from 30 different destinations for its sandy beaches, year-round warm weather and world-class recreational activities such as surfing. Occupying 75 acres of beachfront on the southern tip of the Emerald Coast of Oaxaca, Vivo Resorts includes 800 yards of frontage on Palmarito Beach and offers ocean views from every suite.